A lot has changed since the Church World Service organized the first charity walk in 1969, but the one thing that remains consistent is that this type of event continues to raise money and increase engagement. As effective as run/walks are, the modern nonprofit has the opportunity to improve the organization and execution of these events, which are often associated with high costs. With modern fundraising software, nonprofits can be more organized in their planning and enable participants to have a greater impact. Charity run/walk events really took off in the fitness-focused 1980s and have continued to grow since then. The popularity and pervasiveness of run/walk/ride events has led some critics to question whether they are a truly efficient fundraising option. The truth is that events such as these come with high operational costs, with the need for race officials, timing equipment, barricades, and amenities. These are important costs to consider when planning your own race, but as it stands, many nonprofits have found success in these community events. While event costs can certainly cut into the bottom line, endurance events actually elicit more and larger donations than non-physical fundraising events. Researchers attribute this to The Martyrdom Effect, which states that people “derive meaning and value from having to work hard and suffer for their chosen goals.” (51, The Science of Giving) In other words, donors feel better about donating to the fundraising page of a friend who is running a marathon than they do by simply clicking the organization’s “Donate” button. Beyond the issue of dollars and cents, run/walk events are also a great marketing and public relations opportunity. Which is more likely to get covered by the local news: a 5K shutting down a couple of city blocks or a simple online fundraiser? Even if your fundraising results are hampered by operating expenses, you still gain exposure and visibility to the cause. This means the next time you’re having a traditional donation drive, more people will be familiar with your organization. While runners are used to paying to participate in an event, the registration-purchase model limits the fundraising potential of a run/walk event. Fortunately, more and more organizations are adopting a fundraise-for-entry system or even a registration plus fundraising model. The first option is ideal for partnerships with high-demand races like the Boston Marathon, where there are far more people who wish to participate than there are entrance slots. In such races, charity partners are allotted a certain number of bibs (paper numbers worn by participants) for fundraisers and the organizations can then set their own fundraising minimum. Nonprofits can then ask participants to fundraise $500, $2,000, even $5,000 for the chance to run. This model can also be used for smaller races, but it’s wise to be more conservative with fundraising minimums there. Another option for nonprofits is to charge a standard registration fee but also ask participants to create a fundraising page. Registration + Fundraising is an awesome new feature on the Classy platform. It works a lot like a traditional registration process. A participant registers for the event and pays the fee, but they then have the option to activate a ready-made fundraising page and ask their friends and family to support their endeavor. The $50 registration fee covers the costs of the event and leaves some profit for the cause, and every donation to the participant’s fundraising page can go directly to your programs. 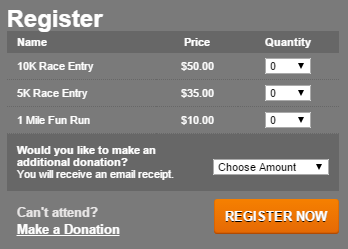 There are many other features of modern fundraising software that make it easier to plan and manage a run/walk event. Not only can participants register ahead of time to minimize day-of registration and payment, nonprofits now have the tools to gather details such as participants’ email addresses and billing information while also offering race information to supporters, all in one place. Setting up these registration features will help you be organized and prepared for the big day. To begin with, nonprofits can offer different types of registration and schedule and allocate resources accordingly. You may, for example, want to offer races of different lengths. You now have the option to register people for the one mile fun run, the five kilometer race, or the 10 kilometer race. This way you can offer multiple ways to participate and have a head-count of each distance beforehand. You can also create custom questions for your registrants. One of the most common uses for this feature is to track T-shirt sizes. When you can find out participants’ sizes at the beginning, it makes it easier to order the right shirts in the right amounts. No more running out of mediums and sending everyone home with an extra-large. 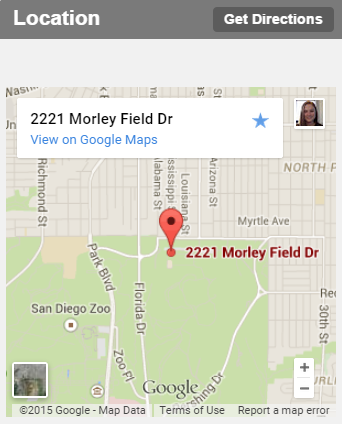 By setting the location for your event on your registration page, it will automatically pull up a Google Map with a link for participants to get directions. All these built-in features in your fundraising software can make organizing a run/walk event much easier and simpler. It streamlines the process for participants and allows you to plan for the expected turnout and handle all the financial processing ahead of time. Then you can focus on the event and programming to make sure everyone has a great time. The planning and execution of charity run/walks may have changed (for the better) in the past decade, but what remains the same is the engagement and community spirit such an event creates. Whether you’re planning your first ever 5K or looking to revamp your walk this year, take time to consider which fundraising model will work for you and how you can use your fundraising software and tools to reach your goals.